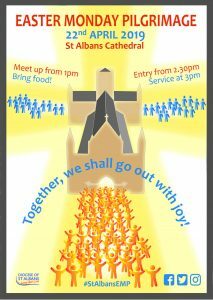 Join other pilgrims from across St Albans Diocese to celebrate the risen Christ on Easter Monday at St Albans Cathedral. Now in its eighth decade, the annual Pilgrimage and service have become a family event which now includes grandparents, parents, young children (in pushchairs), babies (in prams), the family dog (on a lead) … and of course muddy boots! All are welcome. We gather on Easter Monday, 22nd April, in the Abbey Orchard around 1.00pm for a picnic and games together. We then join the procession into the Cathedral for the Easter Monday Service which begins at 3.00pm. The service finishes by 4.30pm in plenty of time to walk or drive home.